This section of river was the scene of the first paddle steamers. The river here offers the greatest range of scenic variety, flowing through dairy farmland, willow lined river banks, spectacular high golden cliffs, station country, river flats and irrigated orchards. The cruise passes through a number of major towns, under bridges and through 11 locks. See the Rufus River and cruise up the Darling River, experience the ‘Outback’ between Renmark and Mildura. Bird life abounds and this section is rich in aboriginal and European history. Day 1. Early morning coach transfer from Adelaide CBD to Goolwa to join "Spirit of the Murray". Cruise upstream past the town of Clayton, Point Sturt and across Lake Alexandrina (subject to weather) to Point Pomanda. Re-enter the Murray and enjoy lunch on board cruising past willow lined river banks, dairy farms and towns of Wellington, Tailem Bend & Murray Bridge, past historic Mannum, to Walkers Flat for coach transfer back to Mannum for Dinner, Bed & Breakfast. Day 2. After breakfast return to "Spirit of the Murray", cruise past Nildottie, around Big Bend, passing breathtaking views of the high golden cliffs (the highest on the whole river). Continue cruising past Swan Reach, through Lock 1 at Blanchetown, and on to the historic Riverport of Morgan to stop for lunch in the old railway station. Members of the local historical society will give an entertaining talk during lunch. After lunch re-board the boat and cruise on past Cadell and Red Gum Forests, through Lock 2 to Waikerie for Dinner, Bed & Breakfast. Day 3. Depart Waikerie aboard "Spirit of the Murray" and enjoy spectacular scenery, cruising along Great Yarra Reach, past Overland Corner, through Lock 3, before stopping at Kingston on the Murray for coach transfer to Banrock Station. At Banrock Station enjoy wine tasting, lunch and wetlands presentation. Return back to the boat and cruise past Cobdogla and Moorook, along Seven-Mile-Reach (the longest straight stretch on the whole Murray), before stopping at Loxton for Dinner, Bed and Breakfast. Day 4. Depart Loxton, cruising past Katarapko Game Reserve, through Kamakazi Flat, around Whirlpool Bend, through Lock 4 to stop at Berri for a short stop to explore the town briefly. Depart Berri, enjoy lunch on board whilst cruising by Lyrup, through Lock 5, and under the Paringa Bridge as it is lifted. Continue cruising, looking for koalas in the redgum forest, arriving at Renmark for Dinner, Bed& Breakfast. Day 5. 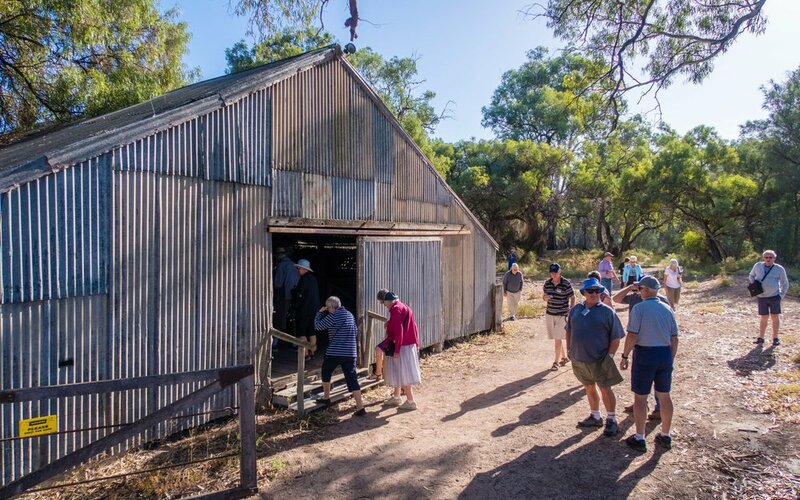 Depart Renmark and cruise to Chowilla Station for morning tea, then cruise through Lock 6. Enjoy a BBQ lunch on the banks of the river at the historic Customs House at the S.A./ Vic Border before cruising on past the ruins of Cal Lal Police Station, Scotties Wood Pile, Pollards Cutting, Murray Sunset National Park to Lock 7 for coach transfer to Wentworth for Dinner, Bed and Breakfast. Day 6. Return by coach, re-board the boat and cruise through Lock 7. Relax as we cruise past Lock 8, enjoying a picnic lunch on board. After lunch pass through Lock 9, see the old steam Kulnine Pump, Frenchmans Creek and the entrance to Lake Victoria. Stop at Ana Branch Station for coach transfer to Wentworth for Dinner, Bed and Breakfast. Day 7. Return coach to Ana Branch Station to hear about some of the early history of the Rufus River area. While cruising enjoy the scenery at Bates, Shallow and Jacksons Reach before passing through Lock 10. Lunch on board as we cruise approx 38 kms along the Darling River to Tapio Cutting before returning to Wentworth for Dinner, Bed and Breakfast. River distance travelled 878 kilometres. Spirit Australia Cruises reserves the right to cancel or alter the itinerary as necessary.